For other people of this same name, see Frederick Jackson and Frederick Turner. 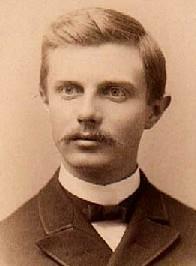 Frederick Jackson Turner (November 14, 1861 – March 14, 1932) was an American historian in the early 20th century, based at the University of Wisconsin until 1910, and then at Harvard. He trained many PhDs who came to occupy prominent places in the history profession. He promoted interdisciplinary and quantitative methods, often with a focus on the Midwest. He is best known for his essay "The Significance of the Frontier in American History", whose ideas formed the Frontier Thesis. He argued that the moving western frontier shaped American democracy and the American character from the colonial era until 1890. He is also known for his theories of geographical sectionalism. In recent years historians and academics have argued strenuously over Turner's work; all agree that the Frontier Thesis has had an enormous impact on historical scholarship and the American mind. He earned his Ph.D. in history from Johns Hopkins University in 1890 with a thesis on the Wisconsin fur trade, titled "The Character and Influence of the Indian Trade in Wisconsin", directed by Herbert Baxter Adams. As a professor of history at Wisconsin (1890–1910), and later Harvard (1910–1922), Turner trained scores of students, who in turn dominated American history programs throughout the country. Turner did not publish extensively; his influence came from tersely expressed interpretive theories (published in articles), which influenced his hundreds of disciples. Two theories in particular were influential, the "Frontier Thesis" and the "Sectional Hypothesis". Although he published little, he did more research than almost anyone and had an encyclopedic knowledge of American history, earning a reputation by 1910 as one of the two or three most influential historians in the country. He proved adept at promoting his ideas and his students, whom he systematically placed in leading universities, including Merle Curti and Marcus Lee Hansen. He circulated copies of his essays and lectures to important scholars and literary figures, published extensively in highbrow magazines, recycled favorite material, attaining the largest possible audience for key concepts, and wielded considerable influence within the American Historical Association as an officer and advisor for the American Historical Review. His emphasis on the importance of the frontier in shaping American character influenced the interpretation found in thousands of scholarly histories. His model of sectionalism as a composite of social forces, such as ethnicity and land ownership, gave historians the tools to use social history as the foundation for all social, economic, and political developments in American history. By the time Turner died in 1932, 60% of the leading history departments in the U.S. were teaching courses in frontier history along Turnerian lines. Annoyed by the university regents who demanded less research and more teaching and state service, Turner sought out an environment that would support research. Declining offers from California, he accepted a call to Harvard in 1910 and remained a professor there until 1922, being succeeded in 1924 by Arthur M. Schlesinger, Sr.. In 1911 he was elected a fellow of the American Academy of Arts and Sciences. Turner was never comfortable at Harvard; when he retired in 1922 he became a visiting scholar at the Huntington Library in Los Angeles, where his note cards and files continued to pile up, although few monographs got published. His The Frontier in American History (1920) was a collection of older essays. Burkhart, J. A. "The Turner Thesis: A Historian's Controversy." Wisconsin Magazine of History, vol. 31, no. 1 (Sep 1947), pp. 70–83. Cronon, E. David. An Uncommon Professor: Frederick Jackson Turner at Wisconsin, Wisconsin Magazine of History, vol. 78, no. 4 (Summer 1995), pp. 276–293. Fernlund, Kevin Jon. "American Exceptionalism or Atlantic Unity? Frederick Jackson Turner and the Enduring Problem of American Historiography," New Mexico Historical Review, 89 (Summer 2014): 359-399. This article incorporates material from the Citizendium article "Frederick Jackson Turner", which is licensed under the but not under the . ^ Allan G. Bogue, "'Not by Bread Alone': The Emergence of the Wisconsin Idea and the Departure of Frederick Jackson Turner." Wisconsin Magazine of History 2002 86(1): 10-23. ^ Wilbur R. Jacobs. "Wider Frontiers: Questions of War and Conflict in American History: The Strange Solution by Frederick Jackson Turner." California Historical Society Quarterly, Vol. 47, No. 3 (Sept., 1968), pp. 230. Article Stable URL: http://www.jstor.org/stable/25154299. ^ Alan Taylor, "The Old Frontiers" The New Republic, May 7, 2008. ^ Scharf et al, 2000. ^ Richard W. Slatta, "Taking Our Myths Seriously." Journal of the West (2001) 40#3 pp 3-5. Turner, Frederick Jackson. ed. "Correspondence of the French ministers to the United States, 1791-1797" in American Historical Association. Annual report ... for the year 1903. Washington, 1904. Turner, Frederick Jackson. "Is Sectionalism in America Dying Away?" (1908). American Journal of Sociology, 13: 661-75. Turner, Frederick Jackson. "Social Forces in American History," presidential address before the American Historical Association American Historical Review, 16: 217-33. Turner, Frederick Jackson. The Frontier in American History. New York: Holt, 1921. Turner, Frederick Jackson. "The significance of the section in American history." Wisconsin Magazine Of History, vol. 8, no. 3 (Mar 1925) pp. 255–280. Turner, Frederick Jackson. "Dear Lady": the letters of Frederick Jackson Turner and Alice Forbes Perkins Hooper, 1910-1932. Edited by Ray Allen Billington. Huntington Library, 1970. He died in 1932 in San Marino, California, where he had been a research associate at the Huntington Library. Slatta (2001) argues that the widespread popularization of Turner's frontier thesis influenced popular histories, motion pictures, and novels, which characterize the West in terms of individualism, frontier violence, and rough justice. Disneyland's Frontierland of the late 20th century reflected the myth of rugged individualism that celebrated what was perceived to be the American heritage. The public has ignored academic historians' anti-Turnerian models, largely because they conflict with and often destroy the icons of Western heritage. However, the work of historians during the 1980s-1990s, some of whom sought to bury Turner's conception of the frontier and others who have sought to spare the concept while presenting a more balanced and nuanced view, have done much to place Western myths in context and rescue Western history from them. Andrew Dickson White, Theodore Roosevelt, Woodrow Wilson, World War II, Washington, D.C.